Before I get into this post, I wanted to send out a special thanks to those of you who took the time to add a caption to the previous post. Your creativity and humor were wonderful treats after I arrived home and logged in to catch up on blog duty. I’m still smiling and LOL-ing! I’m not a fan of the Western. I have always found the film genre too gritty, too violent, and too filled with underhanded, unsavory characters. I like comedy, drama, melodrama, a soundtrack, and always a happy ending. But when Joe and I arrived home at 3:00 a.m. after a marathon drive from Fort Lauderdale, we entered the house as if we were a couple of sun-baked cattle rustlers in our own Western. Unshaven. Sweaty. Delirious. Exhausted. Even our mouths were tired as we spoke to on another with jaws that were just shy of clenched. Ironically, our newly repaired covered wagon — I mean the car — was in better shape than we were! Any thoughts or worries about my garden would have to wait until daylight — or at least until I was prepared to see daylight. The forecasters, however, had other ideas about daylight. It seems that the next few days would be filled with heavy thunderstorms, strong winds, and possible hail. What’s a gardener in search of a happy ending to do? I grabbed my bucket, clippers, twine, stakes, and worked between bouts of rain. Stepping outside like Clint Eastwood stepping out of a saloon, my eyes squinted — not because of any sun, but because I could have fallen asleep standing up — as I sized up my tasks to clean up the town. The sheriff was back. The morning glories had climbed up and covered the trellis in my absence. 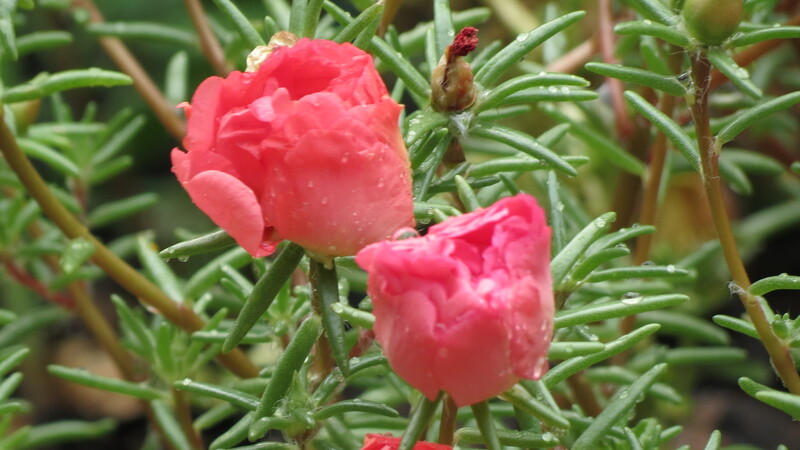 A bed of portulaca had appeared as a result of some self-sowing. The annual scabiosa that I started from seed finally bloomed, its flowers looking like pin cushions. 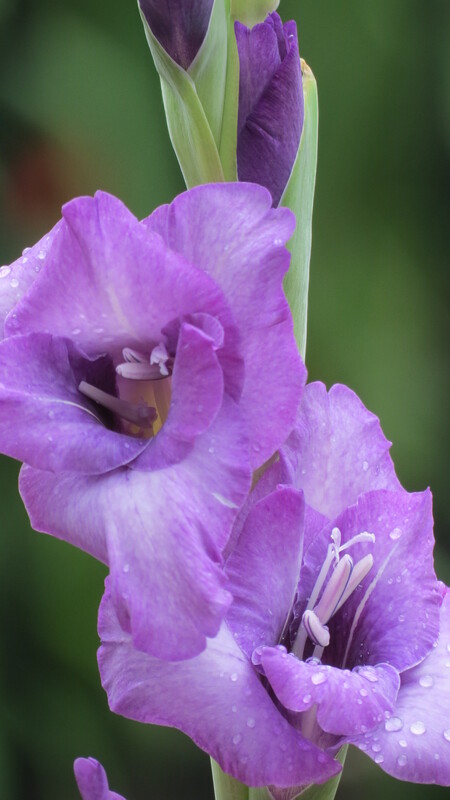 Although many of the glads bloomed and left, there were a few flower-filled stalks still standing. 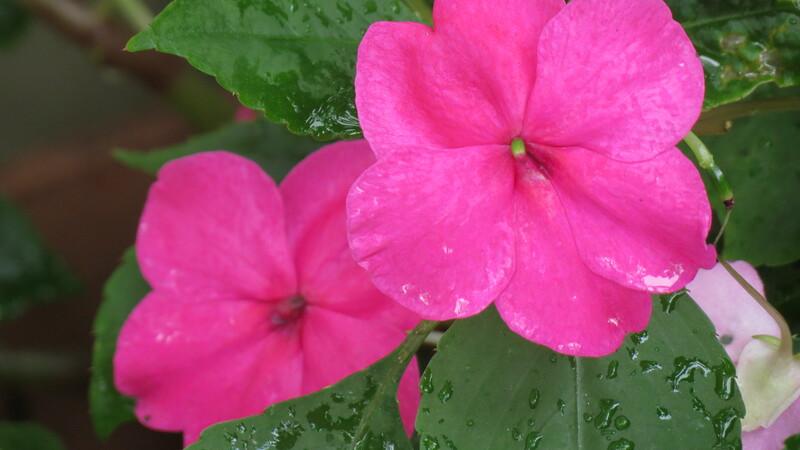 Impatiens, started from seed, are a workhorse in the garden. The hydrangeas seem to have entered a new phase of wonder: faded glory. The heat and humidity of July are canna’s best friends. 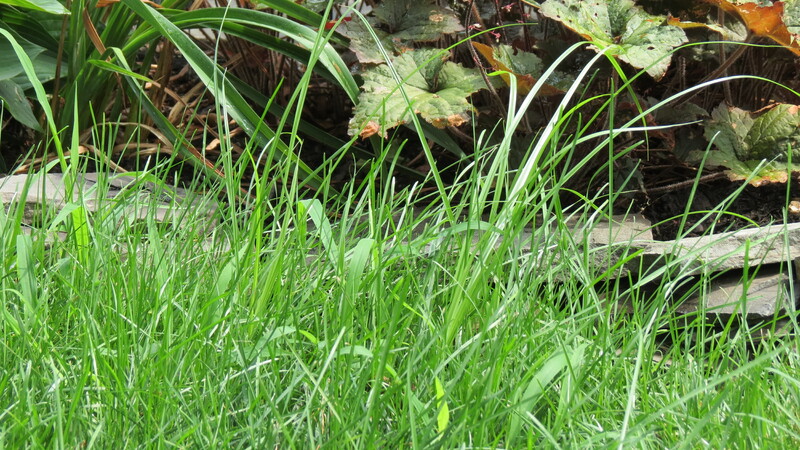 The lawn had three weeks to grow and grow and grow. Time to fire up the lawn mower. 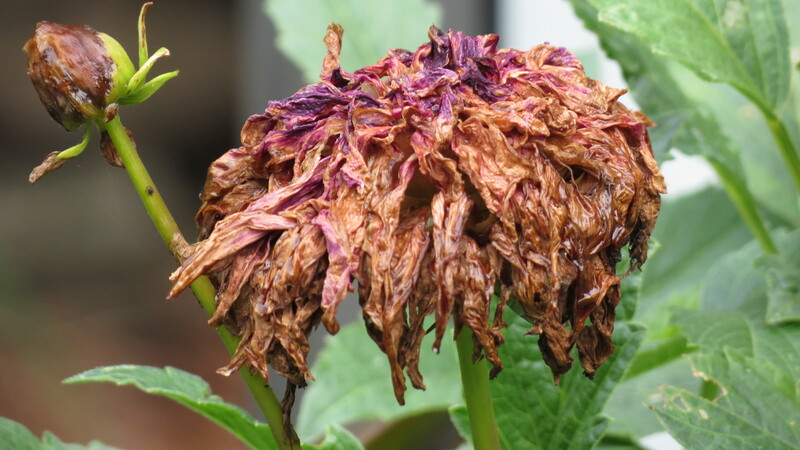 Many of the dahlias bloomed or had fallen over, and were now in desperate need of deadheading and staking. I hope more buds will appear. I enjoy when hostas are in bloom — it’s the after-bloom that makes them look tired and worn out. Nothing that the clippers can’t fix. 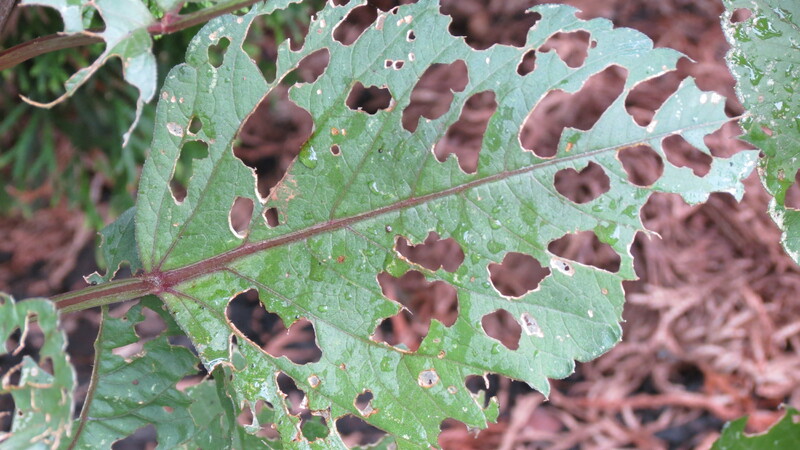 Who’s been eating my dahlia leaves? This photo is the most tragic and the most exciting. 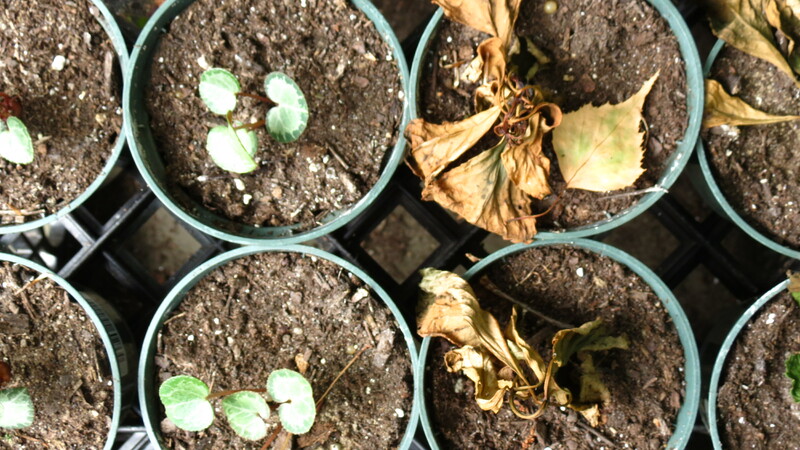 The hydrangeas (right) that I had rooted died from neglect (or, as I think, a broken heart). But the cyclamen (left) are still holding on. Wait a second. That’s a happy ending? Hardy cyclamen? I mean, I think it’s great that they’re still alive and that I grew them from seed, but I need something more. Something big. Something with color. Ladies and Gentlemen . . . the happy ending. A look inside the other-worldly heart of canna. 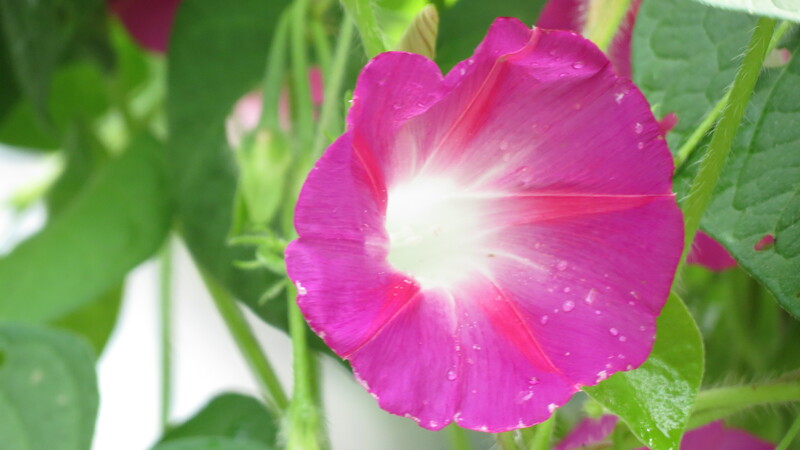 Morning glories are one of the great gifts of nature. On the other hand, I hate it when flowers turn to brown mush in the rain like those dahlias … that’s also why I have a love/hate relationship with peonies. Your “Goods” are really good! The “Bads” are…..well…we all have those after a time period of neglect. We all do what you did – deadhead, clip back and hope for regrowth. 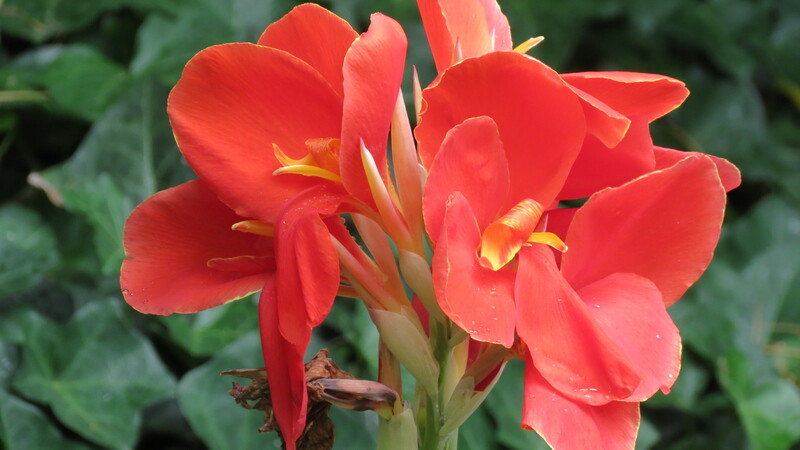 Glad your gorgeous orange canna provided us all with a terrific ending! I have seen a few of those uglies in my own garden! It is a tough time of the year for my garden, but yours seems to be doing well, even with a little neglect. 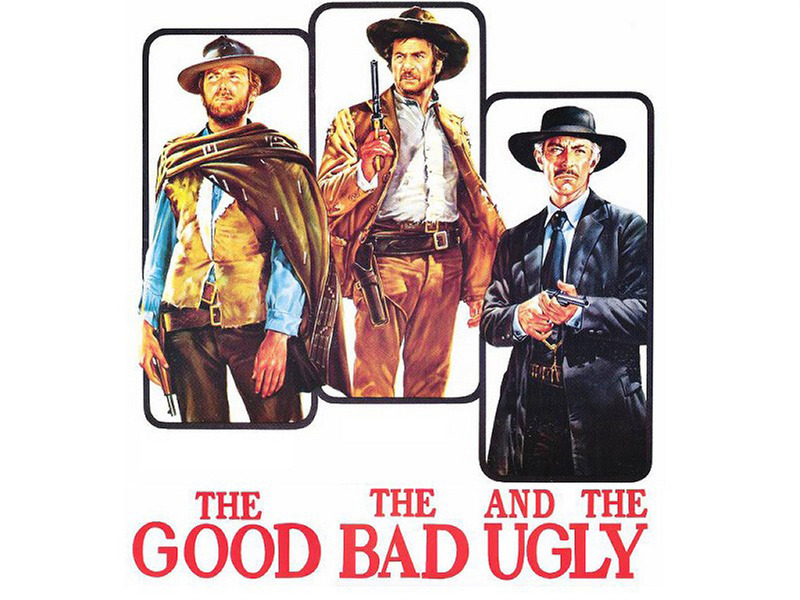 BTW, I’m not a Western fan either, but the music in the Good, the Bad, and the Ugly is among my all time favorite! I agree. Summer can be rough on a garden, even on a good day. And the wild weather certainly doesn’t help. I think it might be time for a garden movie festival! As always your photos take my breath away! Hi Lori. Thanks for that. Hope you’re enjoying summer! Glad you’re home safe and sound. So are we, my friend. So are we. Glad to hear you made it home safe and sound and the garden, minus the hydrangea cuttings, seems to be in pretty decent order. Hi Marguerite. It’s good to be home, and once the primping and cleaning was finished, the garden looked pretty decent — except for those hydrangea cuttings. They were doing well, and even had rooted — so it is a bit disappointing. Oh, well. There’s always some bad and little ugly in the garden. At least, it’s always that way in my garden! 😉 Sorry about your hydrangeas. The canna photo is gorgeous! I guess ugly is a reality of gardening. 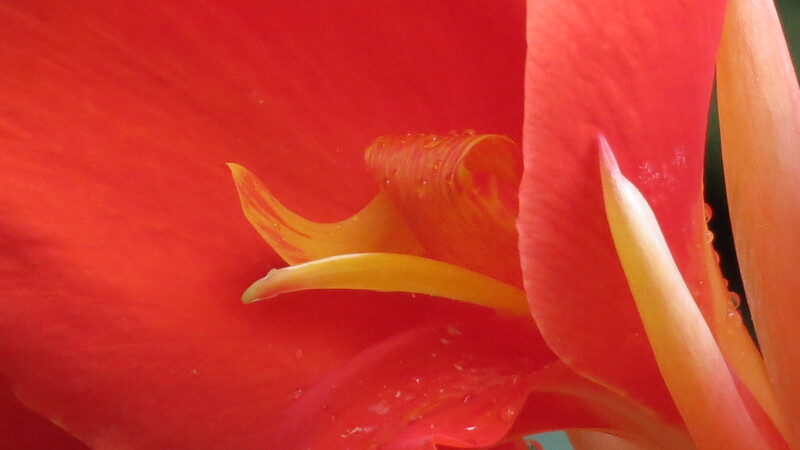 As for that canna, I really enjoy playing with the macro feature on the camera. It allows me to see flowers from a whole new perspective. It looks like there is so much good in the garden, and very little ugly! I am always fighting the slugs in my dahlias and every so often in my hosta bed – but a little beer goes a long way to fixing that! I am sorry that your hydrangea cuttings didn’t root – I think maybe they just missed you! 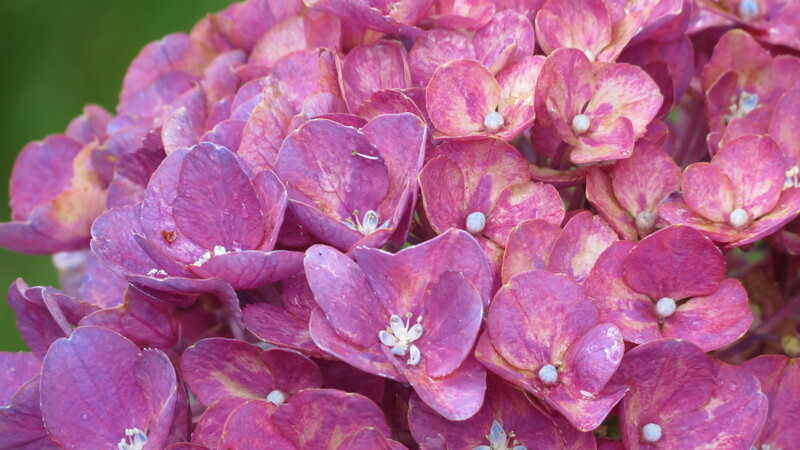 Maybe you can try again – I’ve rooted Hydrangea from April through July … and it’s STILL July! 🙂 I’ve found that single node cuttings root better. So nice to see everything blooming – what wonderful photos! That Canna is AMA-ZING! Welcome back home to all of that work waiting on you. LOL! I am surprised that your cyclamen were still going too. 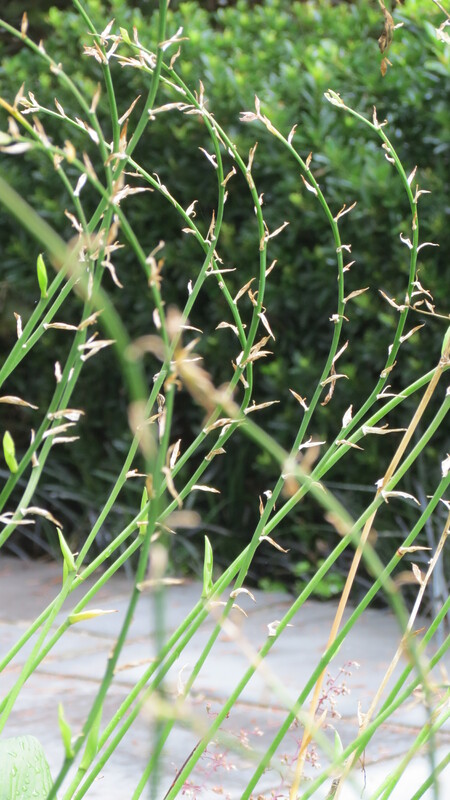 Grass just grows and grows just to torment gardeners. LOL! That is s beautiful Glad Kevin. My Japanese Anemone leaves look like your Dahlia leaves. Some strange black beetles are eating mine. I think they came from outer space and are very hungry aliens. LOL! Have a wonderful week. I think the good stuff wins the battle! Hi Bridget. Yeah. The good stuff is pretty good. Now that everything is back in its place, the losses don’t seem so bad. Hope all is well! Hi Helene. I’ve heard about the weather there — but I’m glad the opening ceremony for the Olympics was rain-free. I know what you mean about the rain. I love rainy days (in moderation) — until I start to feel moldy. Then, sun and warmth is key. Hope you are well! Maybe if I channel my inner Clint Eastwood weeding would be a lot more enjoyable! Thanks for the smile. Lovely! 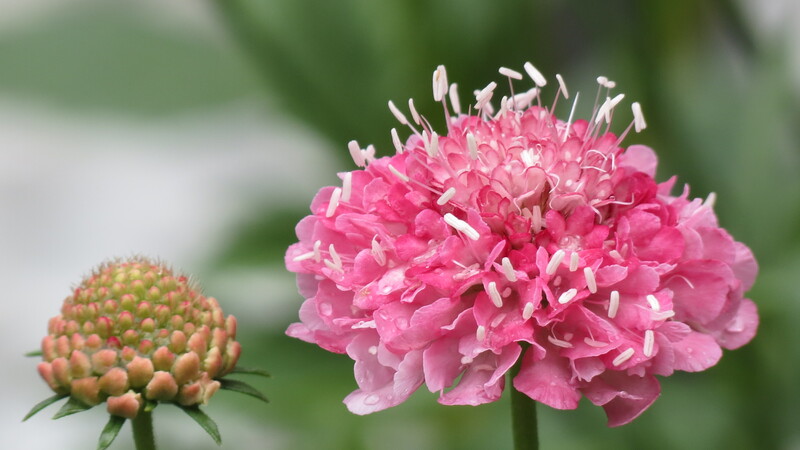 I’d never seen a scabiosa before and think when I’m ready to “level up” in my flower gardening, it will be at the top of my list. There is a perennial version and an annual version. I planted the annual version this year — and they were very nice. I like the pin cushion effect. Good luck with them!